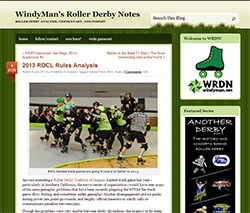 Time to go under the hood on WFTDA official reviews. It’s time we start giving referees a break. Watching the playoffs from home, looking at the reactions of crowds and skaters, and seeing a lot of feedback online, I got the sense that the ref crews at the WFTDA playoffs, particularly those at WFTDA Championships, took a lot of heat for calls, non-calls, questionable calls, close calls, and calls that were extremely unpopular—but ultimately correct. Granted, there were some calls that were very boo-worthy. A few insubordination calls for failing to immediately leave the track after a penalty call were probably unnecessary. There was also the rare moment when an officiating error was flat-out bad, such as the 2-minute overtime jam that only lasted one minute, called off too quickly by an (apologetic) jam timer NSO. But with the number of games, the number of jams, and the number of total events referees needed to judge throughout the WFTDA playoff season, the fact that they got so, so much of it right should be commended. Particularly, since they need to wrestle with the complexity of the WFTDA rule book just as much as the skaters who wrote it. In the few instances when a referee crew was incorrect on a critical assessment, the rules allow a team to use an official review to make their case to the officials to see about overturning the call as it was originally made. The rules and officiating of them are still a work in progress, so allowing skaters to point out a clearly-wrong call to the officials is important to make sure it does not unfairly swing the outcome of a game. However, a discouraging trend among skaters and teams appeared during the tournament season, with regards to the official review system. A lot of teams requested official reviews that seemed dubious themselves, requesting that referees stop the game to try and overturn calls that were obviously correct in the first place, or ask the referees to issue a penalty to an opponent that clearly did not happen. At the time of their request, they seemed like simple uses of the review system. But two of them revealed an underlying motivation for their use, one that was inconsistent with the spirit of the rules and one should be stopped before it gets out of hand. The first is from the Texas-Gotham championship final. With 6 minutes left in the first half, Olivia Shootin’ John and Bonnie Thunders take to the jammer line. Both get out of the pack quickly, but LeBronnie eats the baby on OJ, eventually causing the Texas jammer to commit a cutting penalty. Gotham goes on the power jam, and after two snoring passes—sorry, scoring passes—of passive offense, the Texas 3-wall finally manages to shove their mark out of bounds at turn 4, recycling everyone back into the awaiting Gotham rear wall. The three Gotham blockers try to hold Texas from recycling Bonnie all the way behind the pack, but a Texas blocker finds an open lane. Just as she starts moving clockwise behind the Gotham rear wall, Bonnie starts moving in the derby direction and re-enters behind her. From most angles, this was a close re-entry. The crowd saw Bonnie cut the Texas blocker and demanded a penalty, as is what crowds tend to do when a call does not go the way of the popular underdog. The refs saw a legal re-entry by Bonnie and went about their business, as is what referees tend do when there is no penalty to call. Bonnie saw 20 points go up on the scoreboard, as is what Bonnie tends to do when she is on the power jam. Texas, on the other hand, thought that the crowd was right and the referees were wrong. After the jam, they asked for an official review of the non-call on the alleged cut committed by Bonnie during the sequence, figuring Gotham deserved to be down a jammer—and they were owed a power jam. Let’s play head referee and try to see what Texas might have seen (from their poor bench position) that the referees may have missed, information that they would have provided to aid their case in the official review. The replay of this jam is here, with the “cut” happening about a minute in. Watch the moment in question. Was it a cut? Was it legal? Was it clear? Was it close? Even if the referees had the benefit of video review, it is hard to tell for sure. 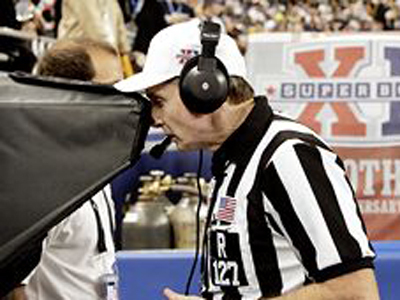 There is another way to determine what the correct call is. This method is intuitive, accurate, and simple. It involves knowing what the exact result of a potential review will be before requesting one, therefore not requiring the use of one in the first place. Watch the replay of the jam again. But this time, do not watch the jammer and the blockers and the hips of the players. This time, look at the positioning of the referees, listen to the announcers describe the moment, and appreciate all the aspects of the situation. • This is the championship final of the WFTDA. This is the game. The best teams, the best players…and the best referees. Everyone on the track wearing skates and stripes got there because, like the players, they earned the position by being the best they could be. No rule misinterpretations. No mistakes. If any crew was going to get all their calls right, it was this one. • So it should go without saying that for the best referees in the WFTDA, basic calls like hips-passing-hips should be child’s play. But being human, they could make mistakes under chaotic situations. Not that this was one of those: Six out of seven refs don’t skate during power jams, either. • Given that the question is whether or not a jammer re-entered the track legally, and that the (best-in-the-WFTDA) jammer ref was in the perfect position to make that judgment, he would therefore be the one person in the building with the best viewpoint and most experience to make it. That he did, when he originally answered the question by not calling a penalty at the time of the alleged cut. • In the unlikely event that the jammer ref was out of position or had his view momentarily blocked (During a power jam? Really?) he has other referees to back him up. After the fact, you heard the announcers go out of their way to comment that the outside pack referee nearest the action “was in great position” to make that call. If the jammer ref was unable to get a clear sight line on the play, the OPR no doubt had one—and he did not call a penalty, either. Summary: The best refs in the WFTDA made a basic call that the primary referee deemed legal and supporting referees (in “great position”) also deemed legal. Yet Texas was under the impression that these best-referees-in-great-position-to-make-a-basic-call somehow got it wrong, that they somehow messed up, and that they needed to talk it over a little bit. You know, juuuuuuuuust in case that what they clearly and concisely saw the first time, a legal re-entry by Bonnie Thunders, was actually an obvious cutting penalty. Shockingly, the result of the official review was to uphold the original non-call on the track. The Texas players and coaching staff would have known—should have known—all of the above. They would have seen that the referees were in the best possible position they could be in for the play, and that any information Texas provided was not going to fill in any gaps. (There were no gaps to fill in.) They should have known their official review was going to be wasted, that it was never going to send The Best Jammer in Roller Derby to the penalty box, and it was never going to grant them a power jam. But it did stop the game for four minutes. At least there’s that. The second example of a highly questionable use of official review was during the Windy City-Philly game on the first day of Championships. With 22 minutes left in the second period and a new jam underway, Philly jammer Vanessa “V-Diva” Sites is up front with lead status. But on the verge of completing her first scoring pass, she illegally applies her forearm to a Windy City blocker and gets whistled to the box. Power jam Chicago. Newly-transferred Windy City jammer Sandrine “The Athlete Formerly Known as Francey Pants” Rangeon racks up a few scoring passes, but then cuts the track. Jammer musical chairs, and the jam ends on time. Though not before Windy wins the jam big and extends their lead to 150-121. Not satisfied with this result, Windy City grabbed the attention of the head referee to ask for an official review. But of what? The cut on Rangeon looked pretty cut-and-dried, so it can’t be that. Sites got sent to the box on the forearm, which was obviously a forearm; not that Windy would be asking to nullify an opposition penalty. Maybe they didn’t like one of the two out of play penalties on the Windy City blockers? Or was there a clear non-call on a Philly player somewhere else? Watching the forearm live, it looked like obviously illegal contact and an obvious major penalty. Watching the slower-mo replay after the jam (watch it here) yielded a similar observation. After multiple viewings, you could make a sorta-argument that it may have been a forearm with some intent behind it. In any event, it was nowhere near the head, and from the view of the camera there was never anything there merited even a whisper of expulsion. The Philly jammer ref made the same observation, deciding that the action was simply a major penalty that required Sites only sit a bit in the sin bin to pay penance for the foul. The Windy City bench decided this was a conscious and forceful shove—despite the poor view of the action they would have had from their position—one that should result in the offending player getting booted out of the game immediately. But what they failed to appreciate was that the result of their forearm review was a foregone conclusion even before the officials went to the huddle. 6.5.8 – Any illegal forearm or hand contact to an opponent that forces the receiving opposing skater off balance, forward, and/or sideways and causes the opposing skater to lose relative position. Watch the forearm. Did the action justify a major penalty? Of course it did, which is why Sites was sent to the penalty box. The following egregious acts using the forearms or hands will be automatic game expulsions… Expulsions will be issued for a conscious and forceful attempt to commit any of the following egregious acts, whether or not the attempt was successful. 6.5.13 – Shoving an opponent. Hmmm. Let’s take another look at that forearm. You know, maybe it kind of does look like a shove? A forceful shove, at that. It almost looks like there was drive behind that forearm, like Sites was…conscious in doing it? Hey, maybe this was supposed to be an expulsion! 9.3.2 – If the referee is in doubt on a call, i.e., the referee sees the effects of a hit but does not see the action, a penalty must not be called. 9.3.3 – If the referee is in a position where intent must be inferred but is not clear, legal intent must be presumed. 9.3.5 – If the referee is not sure whether an action warrants an expulsion or a major, it must be called as a major. There it is, black and white and pink all over: WFTDA rules prohibit referees from issuing penalties or expulsions based on “maybe,” “kind of,” and “almost.” The only time an expulsion is warranted is when—in the opinion of a referee, and only a referee—a player clearly does something to warrant an expulsion. An arm-swinging, closed-fist punch to the forehead is a clear expulsion. V-Diva applying an overzealous forearm into the breasts of an opponent is not a clear expulsion. This means it is definitely not an expulsion. To be more accurate: By rule, it is definitely not an expulsion. By rule, it is a major penalty, at the worst. All the (a-best-in-the-WFTDA) jammer referee was doing when he called a major penalty on the Philly jammer was correctly applying the rules. This is a non-debatable point. We know he did this. Why? Because he called a major penalty, not an expulsion, when he saw the Philly jammer use her forearm illegally. Which makes this review an open-and-shut case…a case closed before the review was even requested in the first place. Curious, then, why Windy City would throw away their second half review so early in the period on challenge they were sure to lose. The only way that penalty could have been upgraded is if their case had clear and concise proof that the forearm warranted an expulsion. Except, they lost that case the moment the major penalty was called. Or maybe…they wanted to see Vanessa Sites—the jammer who had scored 70 of Philly’s 121 points up to that moment—expelled from the game. Maybe they wanted to devastate the Philly jammer rotation to help make things easier on their own blockers. Maybe they just wanted to deal with a tough opponent via rules technicalities, rather than dealing with her on the track. But let’s not be silly. That could not have been why the Windy City coaching staff called for the review! Surely, they only wanted the officials to get a second opinion, to double check their work. You know, to make sure the decision they made did not unjustly affect the outcome of the game. That is the point of the official review system, after all. These were just two examples of official reviews that never should have been. There were plenty of similarly dubious reviews during the playoffs. Many teams asked the officials to retroactively call penalties on opposing jammers that were not called originally. (The non-call on the track stood virtually every time.) Other teams used their first-half official reviews at the end of the period to challenge jam point totals that may have been misreported. (Wild stabs in the dark, all of them.) Those end-of-period reviews were particularly annoying, since they delayed the start of halftime and caused general confusion among the announcers, and by extension, the webcast viewers. But the cut-that-wasn’t-a-cut in the Texas-Gotham game and the forearm-that-wasn’t-a-expulsion in the Philly-Windy game were the most gross examples of why the WFTDA Official Review system, as it is currently, is as broken as the rule set it is a part of. An official review of the rule describing official reviews will explain why. 2.10.1 – Official Review. A team request for a review of an Official’s decision. There is no limit to the type of objection brought up during an official review. Remember the purpose of the official review system: It protects a team from being the victim of an incorrect referee call, by allowing the team to directly challenge that call and get it corrected, if required. This helps ensure that the outcome of a game is not unjustly skewed from the true result. However, because WFTDA rules grant teams an unlimited spectrum of things to challenge, the official review system itself is heading down the road of becoming unjustly skewed. When a team begins to ask for reviews to try to create or upgrade opposition penalties that never occurred, that’s one thing. But when a team asks the officials to review a penalty non-call that they were in perfect position to judge at the time of the non-call, it becomes a serious problem. The problem arises when a referee is rule-bound to presume, or directly observes, legal intent, but this presumption/observation causes the opposing team to perceive that a potential advantage was “taken away” from them. When a referee (with assistance from other referees) is not sure a jammer from Team A committed a penalty, the rules require him or her to not call a penalty. However, from the perspective of Team B, this non-call “takes away” a power jam that it “should” have got, if only the referee had made the “right” call. Hence Team B (Texas, for example) needing to openly question the judgment of the referee making the original call via an official review. Even when limiting official reviews to one use per period, the fact that a team has unlimited reign to challenge any call, for any reason, whether that reason has merit or not, and even if there is a clear 0% chance that the review will end in their favor, is beginning to turn the review system into just another rules loophole that is starting to be tipped for gameplay advantages beyond its original intent. This was an issue that started to appear last year during endgame scenarios. A team needing a clock stoppage in the dying seconds of a close game could object to the officials that they were out of timeouts, request they review that, find out that the result of the review confirmed that they were out of timeouts…and still ultimately be granted a timeout. The rules require officials to stop the clock when an official review is requested, convenient for a team that may have earlier squandered their allotted clock stoppages. This year, the official review loophole is being used by teams to try and get opposing jammers sent to the penalty box or ejected from the game. Within the context of the rules, this is pretty good strategy. The only downside to using a review in this fashion is that you lose it for the remainder of the period—not much of a problem if the period is almost over. But the upside is huge: You get a free power jam. You send their best player to the locker room early. You make it easier for yourself to win the game. Herein lies the problem. Much like with power jams over the last three or four years, this is a loophole that skaters may want to keep around for the potential short-term benefits, but is one that makes the WFTDA as a whole worse off in the long term. More official reviews mean more game stoppages and longer game delays, which nobody likes. Officials that know they are doing their job correctly may begin to feel discouraged that any close call may trigger an official review, for no other apparent reason than the team requesting it thinks they know better than the referees. If this happens enough, officials may begin doubting their own calls before they even make them, compromising the integrity of referees and the sport as a whole. Of course, a good official—a professional official—would not allow such things to happen. But not every official affiliated with a WFTDA member league is good. Apparently, neither are the crews that staffed the games at WFTDA Championships; if high-level teams feel the need to use official reviews to make sure high-level referees got the tough (but clear) calls right the first time, they apparently don’t think much of them. For another perspective on official reviews in derby, check out RDCL (banked track) rules and its Challenge system. In a developing ruleset full of contradictions, the Official Review system is one that needs resolving. Yes, it is contradictory: The rules force officials to be sure when they make a call, but the rules do not put the same burden on skaters requesting a review of such a call. If the referee is wrong with a call, he or she gets reprimanded, gets dinged, gets blamed. If the skaters are wrong with an official review, they get a free timeout and a lengthy rest break. It’s about time the WFTDA gives referees a break, too. There is a simple solution to eliminate frivolous official reviews, and it is one that many major sports leagues use to protect the integrity of their officials and to try and keep games moving. If a team loses an official review (i.e., “the call on the track stands”) charge them with a team timeout. If it is out of timeouts, they should then lose their ability to review a call—or at the very least, are prevented from using a review to gain advantage from any temporary clock stoppages. Doing this ensures two things. For one, it makes sure every game stoppage is justified. If a review determines a call was incorrect, the official review did its job and the delay became retroactively necessary to right a clear referee error. If a review determines a call was right the first time, on the other hand, the game stoppage was unnecessary, meaning the team that requested it is to blame for wasting time. Losing a team timeout should make up for nicely. More importantly, a system like this would hold skaters to the same guidelines as referees: If you’re not sure, don’t call it. Timeouts can be valuable assets, especially in close games. If a close or questionable call is made, using an official review should be done with care and consideration, the same care and consideration that referees take in making calls. If a bench knows 100% for certain it can get a call overturned, then calling for the official review will pan that out and nothing would change from the current system. But if a team is in a position where they think they saw a penalty, they think an upgrade is warranted, or they think they can get an opponent ejected based on questionable evidence, then they would need to decide if potentially losing a timeout is worth throwing the hook-and-line out to see if what they are fishing for will bite. Doing this should all but close the “dubious review” loophole and put the benefit of the doubt on close calls back in the hands of the officials, not the skaters that can question them after the fact. It will further reduce game delays. It will also protect skaters from themselves, forcing them to hold onto their official review on events that may unjustly affect them, rather than trying to unjustly affect the other team. A step similar to this would go a long way in helping the WFTDA work toward a complete set of rules for its version of roller derby. With all the talk about improving the rules for skaters and improving the rules for fans, we cannot forget that making improvements for the rules specifically for referees are also important. A wholesale simplification of WFTDA rules would be the ultimate goal in that regard. But in the meanwhile, changes to the review system, a reduction in the amount of things any given referee needs to track, or more consistencies in how penalties are judged (see: forearms) would go a long way to improving things for them, and improving things for everyone. But this can only happen if we start giving referees and officials a break.